Your new dogwoods are bareroot saplings, about 12 inches long, which require care before you plant them. The dogwoods have arrived with material around the roots to keep them moist. Please make sure you keep this material covering the roots until you are ready to plant, and plant them as soon as possible to ensure survival. If you can’t plant immediately, saplings should be kept in in a refrigerated unit at a temperature between 33 and 38 degrees F with 85 to 95 percent humidity. If no refrigeration is available, saplings can be stored at 38 to 50 degrees F for 2 to 3 weeks, or at 50 to 75 degrees F for 3 to 5 days. Temperatures above 85 degrees F will quickly kill stored saplings. Choose a site for your dogwoods that is well-drained but does not get extremely dry. Soil high in organic matter is best. Dogwoods can be planted in full sun or partial shade, though partial shade is best (morning sun in particular). Dogwoods are typically an understory tree in the wild. Dogwoods are easy care trees that will likely bloom by their second year, but sometimes will bloom in their first year. Before you plant, cut off any damaged roots with a sharp knife, and soak plant roots in water for 3-4 hours. Bareroot saplings can be planted with a planting bar (often called a dibble), shovel or mattock. Saplings should be planted no deeper than the depth they were planted in the nursery. You can tell the depth in the nursery by a slight color change on the stem. If you cannot see the color change, you should plant the trees with the graft unions above grade, around one inch. Mulch should not cover the union as it will kill the tree. 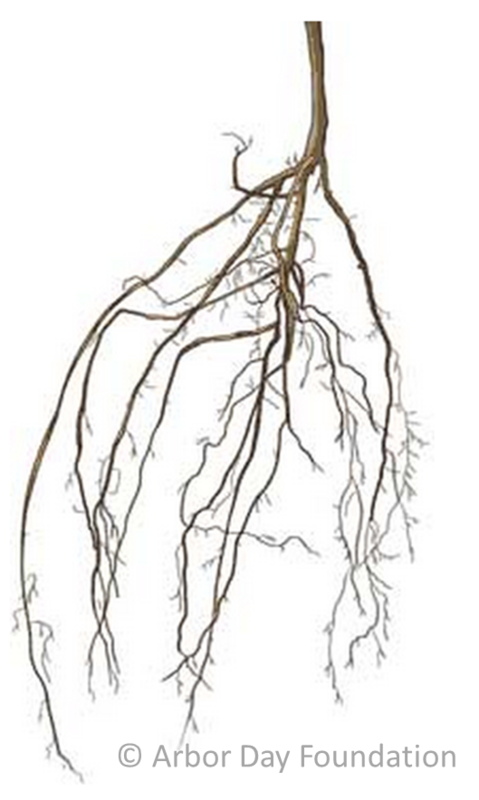 Make sure the hole is big enough to allow the roots to be spread out, at least 1 foot wider than the root spread. Roots should be pointing straight down in the hole and not “J” rooted (roots bent back pointing towards the top of the hole). Fill with same soil that came from hole-mix topsoil and subsoil together. 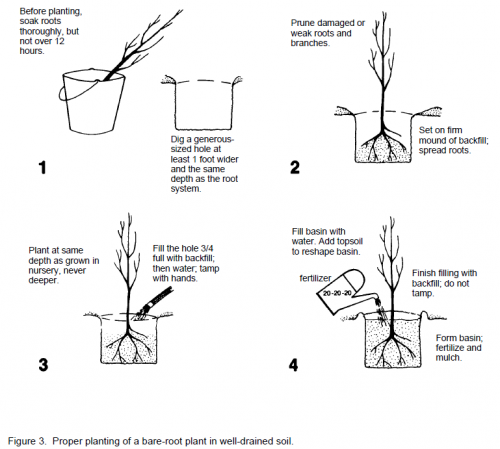 Watch Arbor Day Foundation's video on how to plant bare root saplings. From “Planting Landscape Trees and Shrubs” Michael N. Dana, Purdue University Cooperative Extension Service, West Lafayette, IN (1995). We recommend that you mark your planted tree with a flag or a protective tree sleeve (examples here and here) to protect your new tree until it becomes established. Place a layer of 3-4 inches of mulch around your newly planted trees, taking care to not pile the mulch too high on the trunk of the tree. You may fertilize your dogwoods at the time of planting and first watering, but do not fertilize again until the second year. Watering during winter is rarely necessary. In summer and fall, water once or twice a week. When watering, thoroughly soak root-zone area and beyond. After the first growing season, rainfall should be adequate except in times of drought. Fertilize trees in the second year twice a year, in February and mid-June. Fertilize with 3 oz of nitrogen per 100 sq feet of ground area surrounding tree, and water after fertilizing. Do not prune your dogwood until the second year. Keep the soil within 30 cm (1 ft) of the base of each plant free of grass and weeds with a mulch of peat moss, bark, leaves, wood chips, or similar composted organic material. During a long dry period, supplemental irrigation may be needed. Plants should be pruned every 5-10 years to maintain good shape. Avoid fall pruning because it will destroy the buds for the next year. Avoid pruning old, dried-up flowers. Appalachian Spring is the only flowering dogwood resistant to dogwood anthracnose disease. Occasionally Appalachian Spring may be affected by powdery mildew, scale, borers, mites, or the Asian ambrosia beetle. Control measures rarely are needed for properly maintained plants – supplemental watering of plants in full sun during periods of drought and prevention of damage from gardening tools. If pests become serious, regular applications of a pesticide may be necessary. Contact the Agricultural Extension Service in your area for current control recommendations. Now that you have planted your dogwoods, make regular observations to track the timing of their leafing, flowering, and fruits (phenophases). 1. Sign up as a USA-NPN observer - Become an official participant with Nature's Notebook and set your username and password. All you need is an email address and Internet access. For a description of each phenophase and to download datasheets for your dogwoods, visit our webpage at http://www.usanpn.org/Cornus_florida-appalachianspring. 3. Report your observations - As you collect data during the season, log in to your Nature's Notebook account and enter the observation data you recorded. More details on the specifics of observing. The USA National Phenology Network’s (USA-NPN) plant and animal observing program, Nature’s Notebook, has roots in repeated observations of cloned lilac phenology, hearkening back to the 1950s. We continue this legacy today, through the promotion of both cloned lilac and dogwood plants for observation. Cloned plants are genetically identical, grown from the same “mother plant.” The value of observations of cloned plants is that differences in individual plants’ phenology can be attributed to differences in local environmental conditions, rather than to differences among the plants themselves. These data help scientists better understand plants’ responses to the changing environment at both regional and continental scales. Plants reproduce either by sexual reproduction, through seeds, or by asexual reproduction, by grafting or budding. Grafting and budding join two plant parts together to form a new plant. One of these includes the scion, which consists of a piece of shoot with dormant buds that will produce the stem and branches. This is joined through grafting to the rootstock, or stock, which creates the plant's root system and sometimes the lower part of the stem. For a successful graft, the scion and rootstock must be compatible, both must be at the right physiological stage, the inner layers between the wood and bark of the stem (the cambium) must meet, and the place where the scion and rootstock are attached must be kept moist until the wound has healed. There are many different ways to graft scions and rootstock, which you can read about here. 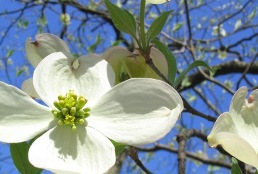 The USA-NPN invites you to monitor cloned plants through the Cloned Plants Project by planting and monitoring a native flowering dogwood “Appalachian Spring” (Cornus florida). Dogwoods are more suitable than lilacs for warmer locations such as the southeastern United States. The data that have historically been collected on cloned plants, including lilacs and honeysuckles, represent the only geographically extensive on-the-ground data set in the United States. These observations have served as the basis for a number of scientific studies on the relationship between climate conditions and the onset of spring. These relationships are valuable in predicting how spring onset may shift under altered climate conditions. A geographically extensive set of repeated observations of cloned individuals, following standardized protocols, has great value for many applications, including predictive models for timing of spring arrival. Flowering dogwood (Cornus florida) ‘Appalachian Spring’ is a deciduous, multi-branched shrub or small tree that reaches a height of 20 to 25 feet tall with a crown spreading up to 20 feet. Leaves are opposite, simple, medium green and slightly larger than the native flowering dogwood. Veins are parallel and follow the elliptical shape of the leaf. In the fall, the leaves turn red or purple. The yellow, clustered flowers are inconspicuous and surrounded by four large, showy, white bracts. The fruit is a yellow to red drupe (a fruit with an outer fleshy part and a hardened shell inside, such as a cherry) that holds 1 to 2 cream-colored, elliptically-shaped seeds (more info on basic botany here).